We are excited to share with you the 2019 MeenMoves Calendar — with strings attached! 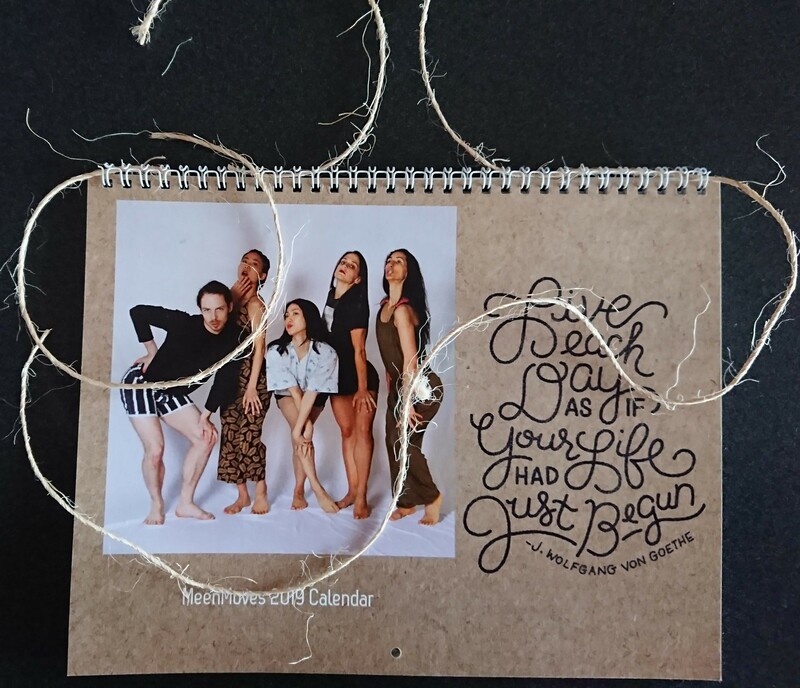 The calendar contains thirteen different images by the talented Maeve FitzHoward that are guaranteed to make you laugh while supporting innovative independent dance and diversity in the arts. Donate $100 or more and get a MeenMoves 2019 Calendar! Please consider donating any amount you can. We appreciate your support. All donations are tax-deductible and go directly towards the creative process for our 2020 evening-length work to be presented before the next presidential elections as well as our educational initiatives with underrepresented populations. Photos in calendar feature members of the MeenMoves team including: Kathryn Alter, Courtney Lopes, Tyler Schnese, Connie Shiau, Stephanie Terasaki, Sarah Timberlake and Shelby Wright.